I have taken a week off from my exercising due to being sick. Everyone in my house caught a cold or something, so I wanted to let my body heal before I went back into my Tap-out training. I had progressed, just before I became sick, to 4 days a week of training.. an improvement over my previous 3 days a week. I was really finding it a lot easier to get through my workouts, although I was still almost destroyed after each one. While I wasn’t seeing the dramatic results I see on the videos or the testimonials, I was still feeling stronger and much healthier. I suspect that I was not getting such great results as I was only doing half the recommended workout, and not really following their nutritional guide. What can I say? I love to eat. 1. Eat only when hungry. 2. Forget what your mother said, you don’t have to finish it. 3. Eat food naked as often as possible (this means don’t add butter to toast). 4. If you feel guilty about having something, then don’t. 5. Don’t eat late at night. I did find this interesting article which tries to boil down the points into some more tips. I will keep on with it and update you all on my progress, as well as update my 13 skills. Bacon during the curing process. Looks good enough to eat. I have been working on another 13 skill this week… completing my skill in preserving meat. 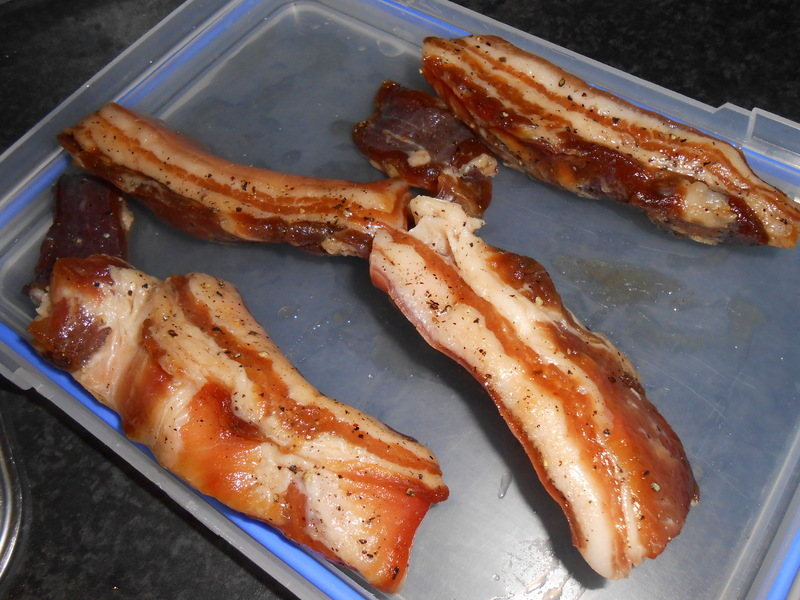 I have attempted to make bacon, using the instructions I found in this blog. I was buying meat last week and I noticed a sale on Pork Belly. I bought 4 small pieces so that I can run a test before I try the real thing on a large piece. I have been using some instructions I found on a website with the one modification that I have not added Saltpetre as I couldn’t find any. I understand Saltpetre is Potassium Nitrate, while it does help preserve the meat, is usually used to make the meat a pinker colour and therefore appear more appealing. It has taken 6 days, yet the Bacon is now ready. I have to say though, it looked pretty terrible near the end. You can see in the above image from before I placed the Bacon in the water for two days it actually looked good… well, I should say it looked good to me. Now that I have tasted it I can say that it tastes pretty good. Not as mind blowing as people have been telling me it should be. I am already thinking of ways which I could use to make the Bacon taste even better by adding additional flavours and modifying the procedure. 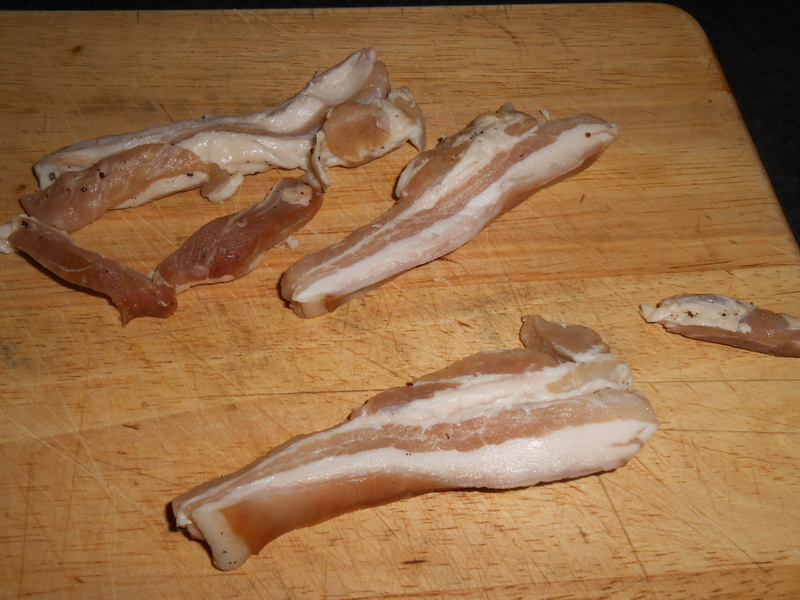 One of the pieces of Bacon, which I sliced to be fried. I am coming to the end of the main growing season in my garden, with my Beans now ready to harvest (as well as putting some away for planting next year). I am intending to plant something over the top of them, such as Carrots, and use a small poly tunnel to allow them to grow throughout the autumn months. My potatoes also appear ready to harvest, yet I will keep them in the ground for a while to stretch out their usefulness. With the coming of the colder months I have thought I might give mushroom production a little try. I saw an interesting article on people using Mushroom compost to act as the inoculate and actually growing the fungi from the bags of mushroom compost themselves. I have thought about placing a couple of bags of mushroom compost into one of the small greenhouse structures, with the inside darkened to provide the low light level I require as well as act as a heat sink to keep the humidity they need. I don’t know if this will work, yet it can’t hurt too much to try it. I have accidentally grown some fungi from the mushroom compost that I mixed into my garden beds last year… so I guess if I can do it accidentally, I should be able to do it intentionally. This will be another of my 13 skills that I hope to work on this year.